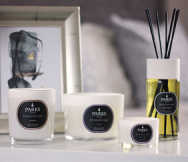 Parks’ Fine Fragrances line is filled with candles, reed-diffused perfumes and other products that are guaranteed to be of the highest possible quality and will provide the finest experience when used. Like everything that we produce, we handcraft the candle from the purest waxes, as well as the best possible essential oils, resins and other scents, and also, of course, the best all cotton smokeless wicks available today. Our 30cl vanilla, sandalwood and ylang ylang candle is one of the stars of our Fine Fragrances range. The core of the scent, the essential oils, are all derived from 100% natural sources, and are totally free from artificial chemicals and contaminants. • Ylang ylang is a tree that originates in Indonesia, although it has been cultivated in other tropical regions for generations. It has a rich floral scent, similar in many ways to neroli (orange blossom), but also jasmine and rose. • Sandalwood has a dark, rugged but luxurious scent, which. forms an important counter-point for the brighter ylang ylang, and acts to balance the pairing out well. • Vanilla is, of course, a very familiar scent, and stands at the midpoint between sandalwood’s rich earthiness and the vibrancy of ylang ylang. It adds a rich sweetness as well and may be the first thing you notice, rather than the last. These scents are combined with fine, smoke-free wax and are hand poured into a lovely glass vessel by hand around our soot-free, clean-burning, all-natural cotton wicks. The result will delight you for as many as 50 hours of continual use.